A pescatarian, in case you don’t know, is somebody who doesn’t eat land animals but does eat water animals. So a pescatarian is not a vegetarian. I keep telling you guys I’m not a vegetarian! Just because I usually eat vegetarian or vegan doesn’t mean I are one! 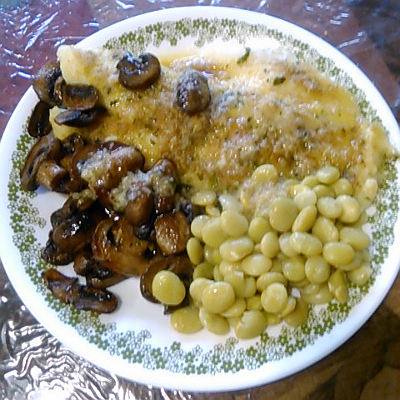 The sides are Lima beans and mushrooms. The fish is orange roughy (wild caught). Take a filet of fish and dry it on both sides. Preheat the oven to 450F Crumple up celery flakes and parsley flakes over it and sprinkle it with salt. If your husband will eat pepper, put pepper on it, too. Put it on a buttered baking tray. Sprinkle it thickly with seasoned bread crumbs. Melt butter and pour over the filet. Bake for about 8 minutes, then check for doneness. Bake longer if necessary, until the fish flakes with a fork. This slab was so thick, it took almost 20 minutes to cook through. Yes, it was well worth the wait! A WRITING PROMPT FOR YOU: Write something with a fish in it. This entry was posted in Food. Tagged fish, recipe (sort of). I could write about something fishy…………. Thanks, Jay! It was delicious!